The Twilight Saga: New Moon stars Robert Pattinson, Kristen Stewart and Taylor Lautner made their first public appearances at Comic Con 2009 to support the next chapter in their pop culture phenomenon. they’ve done this past year. cut the sugars (laughs). It was a lot of work but it was definitely worth it. character that’s able to pull her out of that, it’s a hefty feat which I think we pulled off. But for me, there was no difference. It was just sort of heavier and it was more to think about. She’s older and has more to deal with. to keep building and building, the magnitude of this franchise. Comic Con really was the eye opener and it’s just kind of got bigger and bigger. It’s an interesting thing to deal with. Stewart, visibly appearing the mirror image of Joan Jett for her role as the rocker, shows her humor. Kristen Stewart: I cut off my hair, yeah. She then laughs and quickly dips her head. really excited for people to see some of it. It’s a little overwhelming to have so many people here, but I guess that’s a good thing. 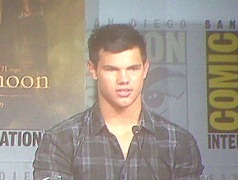 Lautner: It’s awesome because this is our opportunity to thank our fans for everything that they’ve done for us and for Twilight. We get to embrace them again. We’re so thankful for them. being recognized. That’s not exactly the worst thing in the world. When a movie star finds Burger King passing out crowns adorned the headlines Team Edward or Team Jacob, the pop culture phenomenon that is Twilight truly hits the stars. 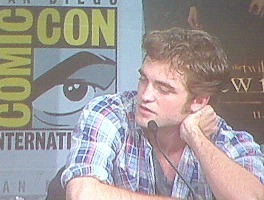 competition (looks at Robert Pattinson). So I’ve done a lot of hard work. that in New Moon, Edward’s presence seems far away. Not, so say the stars. Kristen Stewart: He’s in it a lot. 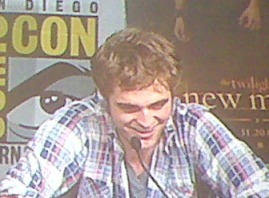 Robert Pattinson: (Fans) won’t be disappointed. I just watched a clip which they’re going to play later and people will forget immediately. Kristen Stewart: If he doesn’t go away you can’t miss him and that’s what this whole movie is about — that empty, completely dark place where Edward is absent. peaceful presence and I got on really well with him. It was…pretty much stress free job for three months. It was great for me. All the pressure was on Taylor. the action in this movie than there was before and there’s also a different dynamic. Now, it’s not just this romance between a human girl and a vampire. But, it’s the beginning of a love triangle.